Insight SiP ISP1507-AL NFC and ANT BLE Modules are based on the Nordic nRF52 chip and are available now from Mouser. The modules provide a total wireless connectivity solution. These BLE modules comprise embedded antennas, integrated DC-DC converter, and both radio and synchronisation crystals. The modules are perfect for combining wireless connectivity in an existing solution or for new applications with basic memory needs. These BLE modules include Bluetooth 5.0. The BLE modules integrate the Nordic Semiconductor WLCSP nRF52810-CAAA chip that provides 32-bit ARM Cortex-M4 CPU with floating point processor. The chip also gives 192kB flash memory, 24kB RAM, a complete set of 13 IOs, analog and digital peripherals, SPI, I2C, and GPIO. 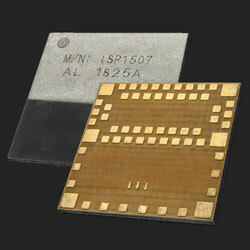 The modules come in 8mm x 8mm dimensions package and are less than 1mm thickness. These BLE modules are ideal for mesh relay nodes and price sensitive solutions, IoT, wearable, industrial sensor, and home network applications.